The Shraddhavans who attended and retained the sweet memories of the two Rasayatras, Shirdi and Akkalkot, now awaited the most for the next one to be announced. The year of 1998, saw this desire of the Shraddhavans being fulfilled when all of them with Sadguru Shree Aniruddha completed the third Rasayatra to Dehu-Alandi. This Rasayatra was organized under the auspices of Shree Sai Samartha Vidnyan Prabodhini. Shraddhavans commenced their journey of the third Rasayatra on the evening of September 1st, 1998, and reached the destination of Shree Kshetra Alandi the following morning. The participation, interest and the enthusiasm of the attending Shraddhavans increased with every Rasayatra. Remembering and cherishing Sant Dnyaneshwar’s composition filled with kindness and compassion is something that comes easily when visiting his own Alandi, which is what every Shraddhavan witnessed too. The Rasayatra began with the Haripath, composed by Sant Dnyaneshwar. Sadguru Shree Aniruddha told everyone the importance of this particular Rasayatra, and under his guidance, the procession of the holy Grantha began. The Granthas, which were written and composed by the saints, who dedicated their lives towards Shree Vitthal’s Bhakti, hold the importance equivalent to that of a Guru in the life of Shraddhavans. Sadguru Shree Aniruddha also mentions and quotes many of the works of the saints in his own writings and discourses. The Dindi (procession) that was initiated, was for expressing love and gratitude towards the holy compositions of Dnyaneshwari, Tukaram Gaatha, Sai Satcharitaand Eknathi Bhagwat. Shraddhavans who participated in the procession danced and moved to the chants and tunes of “Jai Jai Ramkrishna Hari” and “Dnyanoba Mauli Tukaram.” The joy and enthusiasm of each Shraddhavan reached its pinnacle with the participation in the procession of Sadguru Shree Aniruddha. The procession almost looked alike the Vari to Pandharpur. On the same day, in the evening, everyone was given a little piece of potter’s clay, with which, Shraddhavans made the ‘Padukas’ of Sant Dnyaneshwar. At the same time, Appasaheb Dabholkar, grandson of the author of Shree Sai Satcharita, Shree Govind Raghunath Dabholkar alias Hemadpant, created a Shivlinga from the same mud, as instructed by Shree Aniruddha, and performed pooja of it. The Poojan was also performed of all the Padukas made by the Shraddhavans. These Dyaneshwari Padukas were then offered to the Shivlinga. This occasion was graced with the chanting of Gayatri Jap of Sant Dyaneshwar. The night witnessed a beautiful Satsang, which only ended when the next day’s sun dawned. On the second day of the Rasayatra, darshan of the Dyaneshwar Samadhi, Ajanvruksha, Haibatbaba’s Samadhi were taken. During this, Alandi Sanstha felicitated Sadguru Shree Aniruddha, where some sweet memories were shared with all. The stories of how the four siblings, Sant Nivruttinath, Sant Dyaneshwar, Sant Sopandev and Sant Muktabai preached and helped people for their betterment and their devotional stories were shared. In the evening, ‘Amritmanthan’ Upasana was performed. Later, everyone gathered at the banks of the river Indrayani, which is Alandi’s Ganga itself, to perform the Gangapoojan. Here, Sadguru Shree Aniruddha himself completed the poojan of Indrayani Mata and performed the Deep-Daan. Later, all Shraddhavans offered ignited lamps in the flow of the Indrayani. On the morning of the third day of the Rasayatra, Aniruddha Bapu narrated the greatness of Sant Tukaram, and everyone commenced their journey for Dehu. In Dehu, Sant Tukaram’s Mandir, Vaikuntha-Gaman Vruksh and other places were visited. Later, Sadguru Aniruddha mentioned the importance of the Rasayatras in the exact words. ‘The Rasayatras began. Every year to a different place. But, the Rasayatra in our life starts anew and continues forever. 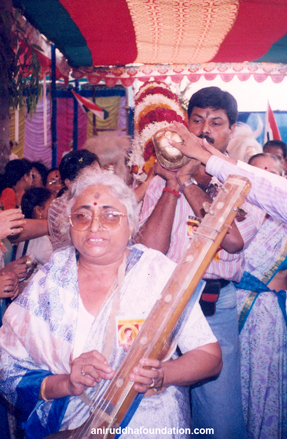 While narrating the importance of Bhakti in one’s life, Sadguru Aniruddha coined a new term, ‘Dnyan-Vidyankaarini Bhakti’. ‘The amalgamation of knowledge and science is necessary. This means a combination of what I like, and what is the truth should occur. A dual mind, between what is the reality and what one desires, leads to fear. To avoid this, knowledge and science needs to come together and this can happen with only the aid of Bhakti.’ With this concept, Aniruddha Bapu explained the term ‘Dnyan-Vidyankaarini Bhakti’. Bapu described the relation of the above with the Rasayatra as, “Such an eternal and constant flow of Bhakti Ras is Dnyandev! Sant Dnyaneshwar was the one to ignite the small lamp of Bhakti and Prem in the current world. In a world where the common man is stuck in ritualism, Sant Dnyaneshwar provided a small but a firm push, thus revitalizing the soul with kind and pure thoughts and emotions. The same pure thoughts and emotions have reached us while doing this Yatra, and we will return holding the same within us.” A positive change, which was going to occur in every Shraddhavan’s life because of this Rasayatra was conveyed in the above words by Bapu. Thus, commenced a new positive chapter in every Shraddhavan’s life, after enjoying and immersing themselves for three days in an unending stream of Bhakti rasa.